The main objective of the day was a walk and survey with Mark and Aled over Moel Ddu above Llyn Cwmystradllyn, however on the way was an inviting bog which no doubt was made even more boggier by overnight rain, with this bog being the connecting bwlch of Carnedd Wen. The bwlch is named Bwlch y Fedwen (the birch tree pass) and for those unusual of habit that like straying in to such wet places it is thankfully positioned beside a road. I had examined this bwlch on a number of Ordnance Survey maps as well as by LIDAR, with the latter not covering the critical point. On the 16.03.18 I had also had a bird’s eye view of the bwlch when visiting the 352.6m high summit of Foel y Bwlch (SH 93936 13273), on that day I planned to survey its murky depths but a prolonged heavy shower and a prior appointment meant that its survey would have to wait. 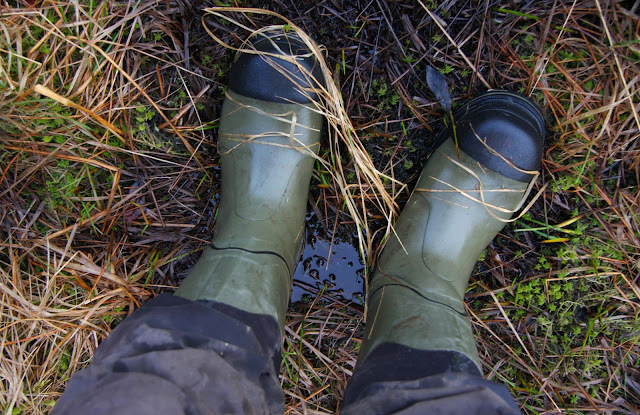 I had my much needed wellies on by 7.50am and walked the short distance from the large lay-by where I had parked to the fence beside the road, except for an occasional passing car and the excited bleating of sheep, all was quiet. I was immediately confronted by a wet drainage ditch on the other side of the fence and once my wellies had made good progress over it I started to assess the lay of land. 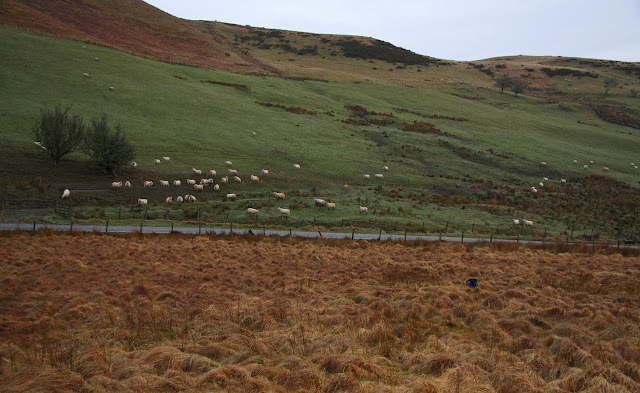 The western part of the bwlch has a small conifer plantation on it, whilst the land to the east gradually declined in a tussock infested way. 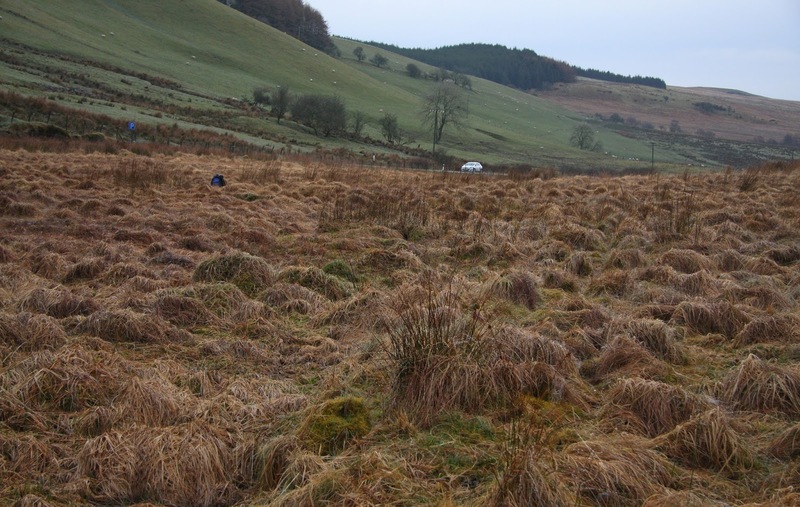 In the centre of the bog is the start of a stream, or at least another wet drainage ditch, therefore pinpointing the land where the critical point of the bwlch lay was relatively easy, all I had to do was walk up the wet land of the stream / drainage ditch heading west until a semblance of dry land was encountered. 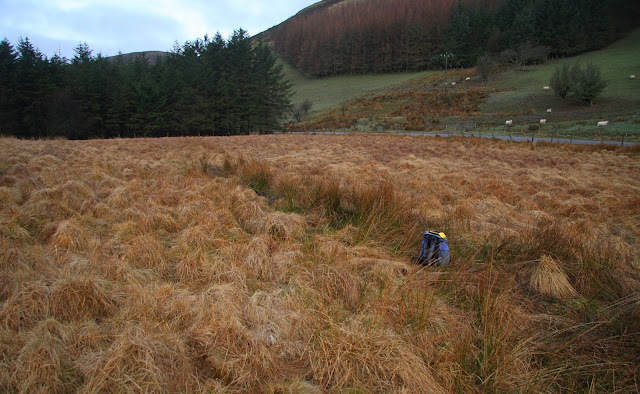 Having done this I decided that time allowed for two data sets to be taken, one from a westerly point relatively near the conifer plantation and one a little further east beside a grassy ridge heading toward the area of the bwlch from the northerly slopes of Tal Cefn, which forms the westerly ridge of Foel y Bwlch. By now a few cars had passed and I wondered what the occupants must have thought if they had glanced my way, I must have looked a forlorn figure stumbling seemingly aimlessly in the bog, wandering this way and that and occasionally even kneeling in the bog to assess the lay of land. 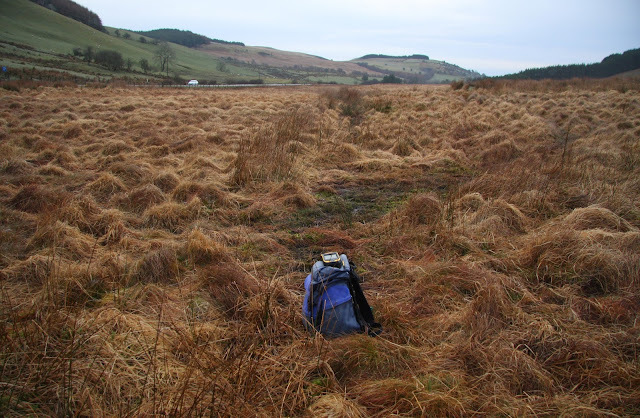 Having set the Trimble up for its first data set I stood as far out of the bog as I could without stumbling too far up the tussock infested slopes. Five minutes fairly zoomed by and once the Trimble was closed down I re-activated it and set it up a little further east for its second data set. As the Trimble beeped away gathering its allotted five minutes of data I stood happy in the knowledge that another bwlch had been surveyed and that the 9.30am meet time with Mark and Aled could be achieved. Once the second data set of five minutes had been stored and the Trimble closed down and packed away I stumbled my way through the tussocks and bog to the fence and the pleasure of tarmac on the road back to my car.